Hypothetical question .Would any of you guys still pick the ETA over the in house if the in house had the same 2 lines of text on the dial instead of the novel? Another thing I like about the 2-liner is it still has an applied lume marker by the date even though it's smaller I like that about it. Same price, both brand new and in front of you for the taking...which one do you grab? Same price, and two lines of text? In-house for me for sure. Shogun says it is 44mm, it wears smaller imo. The bezel sounds "tingy" when operating it. 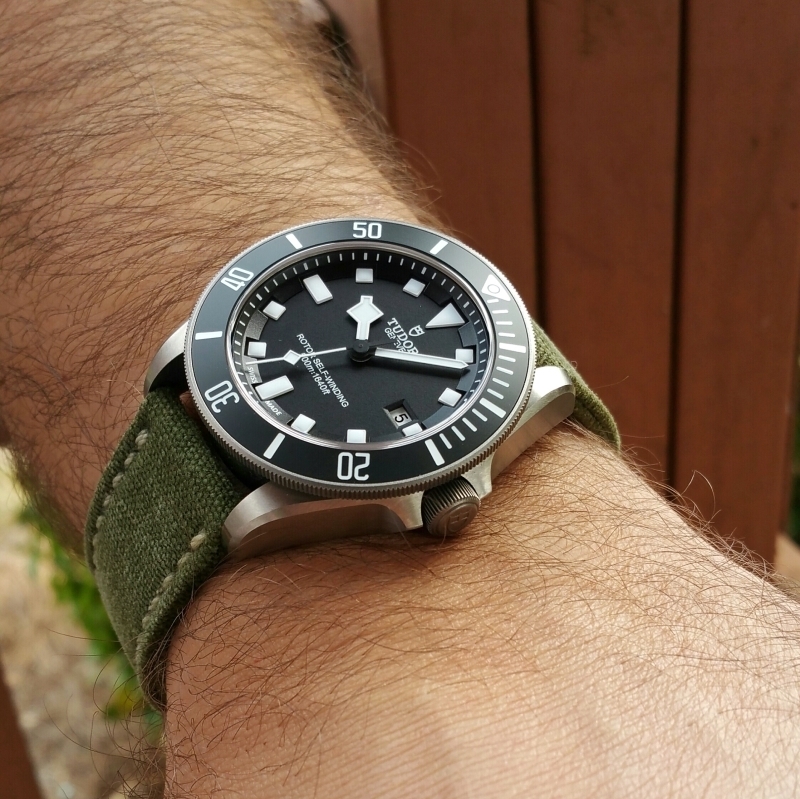 I liked it, but the Pelagos is whole different watch. 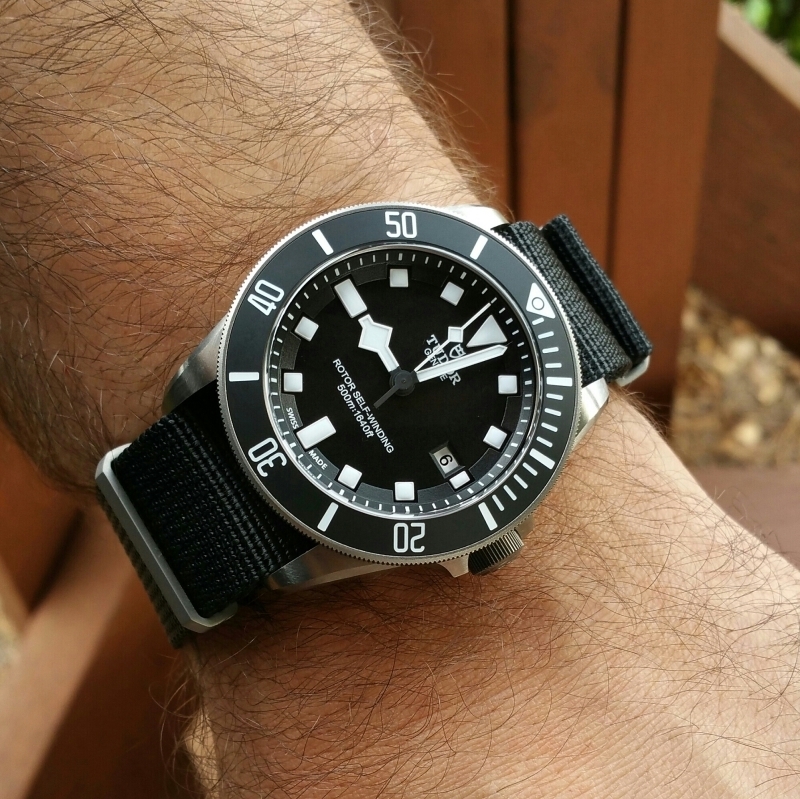 Also the Pelagos has one of the best bezels made imo. I just stumbled across the mido ocean star in titanium...I had never heard of it but it looks really promising and a nice alternative to the Shogun. It is definitely an alternative for sure. I’ve owned this one as well. If you like a good bracelet and don’t mind the orange, the MIdo is an excellent alternative to the Shogun. MIdo seems to do some adjusting on timing on their 2824 movements as both Midos I have owned have been very accurate. The MIdo is super thin and more comfortable on the wrist than the Tudor or Seiko. Wears more like a classic SMP. Hypotheticals are nice to throw back and forth on, but the reality is the Pelagos will very likely remain with 3-4 lines of text. The in-house movement is a nice touch, but IMO not at the cost of having to see all that text on the dial every time you look at your watch. I'd say if you can land a two-liner at a good price, it's worth it. Last edited by Denizen on Sun Aug 12, 2018 11:19 am, edited 1 time in total. Height difference is .5mm and all in the caseback, so yes, the dial is the turnoff for most. The advantages of the in house are clear with double the power reserve and better than COSC accuracy. The ETA movement is more practical. Most watchmakers will have access to parts, whereas the in-house movement will likely have to be serviced by Tudor. I went w the 2 liner. Would rather have the reliability and easy service of the ETA. And thinner, less text, lume plot by the date, etc. I'm forgetting about everything else and I'm just going to save up for the Pelagos, no other stops along the way. ETA or In House is TBD. Because of the date location on their in-house. 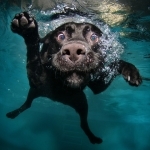 Pelagos!!! Haven’t even thought of wearing anything else since I got it! It is definitely a watch that sticks with you in the head. I keep thinking about another too..... damn I hope they make a thinner version with the new movement. Not to beat a dead horse but I really don't remember Pelagos being particularly thick in any way. I mean it's 14.3 for the in-house and 13.8 for ETA - not thick. Shoot, my SLA017 62mas was 14.1 and it was 39.9mm in diameter, talk about 5x6 look and feel on the wrist. I don't see how Pelagos was abnormally thick unless you're used to some dress watches, plus Titanium is lighter than most of the watches I just mentioned, and half of people around here are wearing them on double-ply Nato that's another 2.5mm additional thickness to the watch. ^ I agree it’s not actually thick, but the style is rather slab-sided and we’ve already talked about lug hole placement. While I like the thinner case (and movement) of the BB58, the side photos indicate it follows the same design and lug hole placement, albeit on a smaller scale. I've had a couple or three as well, and it seems to be sticking for me this time as well. I'm not sure what the change is for me - I'm guessing it has something to do with the meteoric rise in pricing of comparable watches (especially Rolex sport models) that all of the sudden make the value proposition ridiculously compelling. 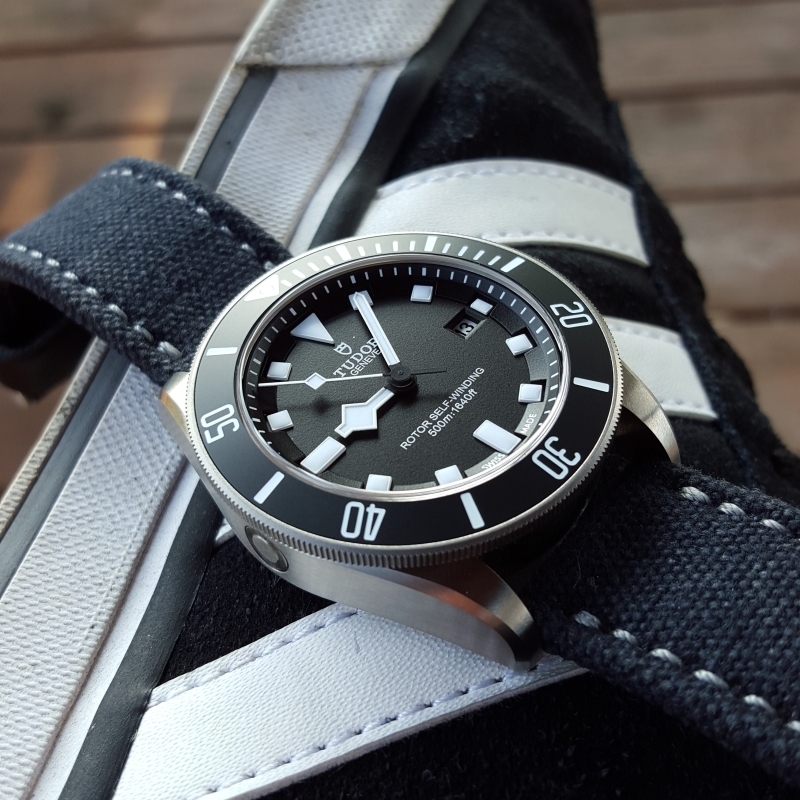 When a No Date SubC was $5k (or an SD-C at $6k) and a Pelegos was $2.5k, it was a bit tougher, even though the Pelagos was a damn terrific watch even at introduction. 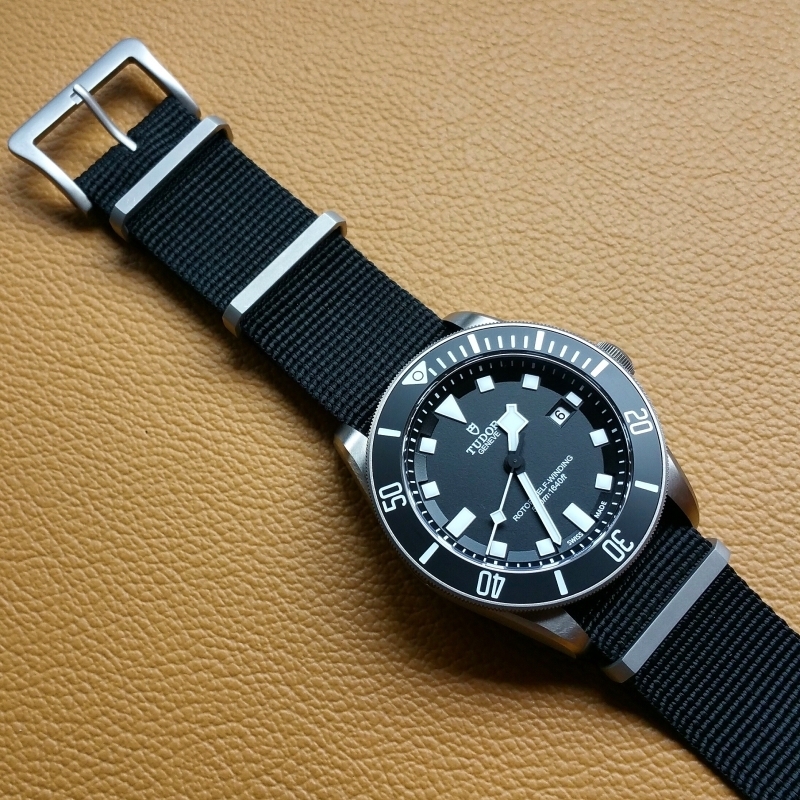 But when that exact same Sub is $7.5k and the SD is $10k, the Pelagos (still at that same $2.5kish) becomes irresistible. I think for me, it also has to do with the fact that my tastes in watches are changing yet again, and if anything, settling down a bit. The watch bubble (both in vintage and Rolex/Patek) has soured me a bit on anything "high-end". Yet another reason Tudor as a whole is appealing right now. It certainly is not abnormally thick, but the gold standard for wear ability is the Rolex sub case profile and the Pelagos wears differently. An incredible watch regardless. Yeah I am going to need to find a 2-liner ASAP. Just a great looking watch. 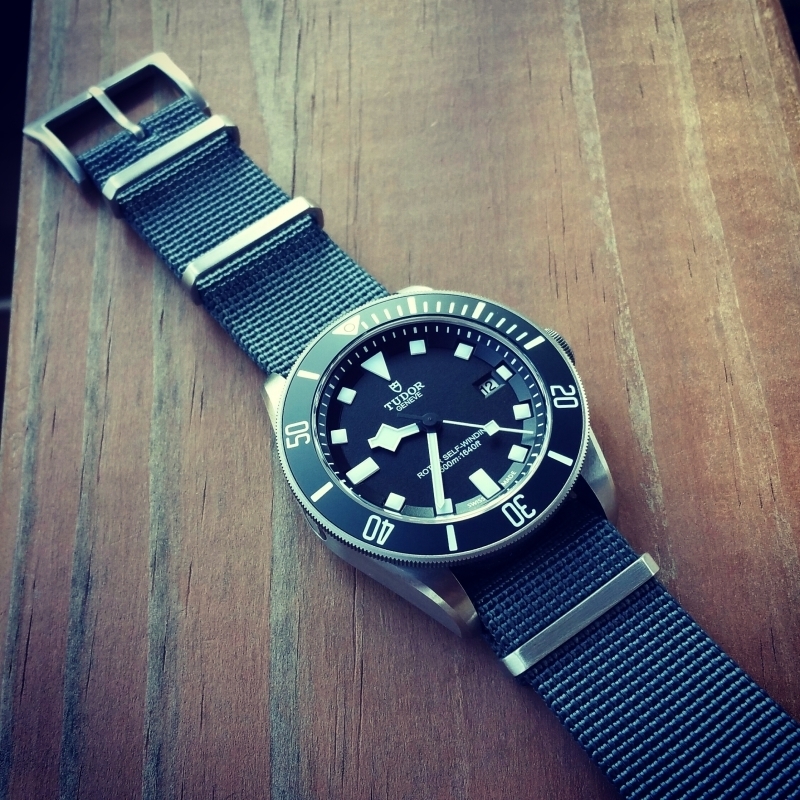 I’ve never handled one and I’ve always been drawn to the Black Bay, but I think I would pick the Pelagos these days. It seems more modern yet somehow cleaner at the same time.